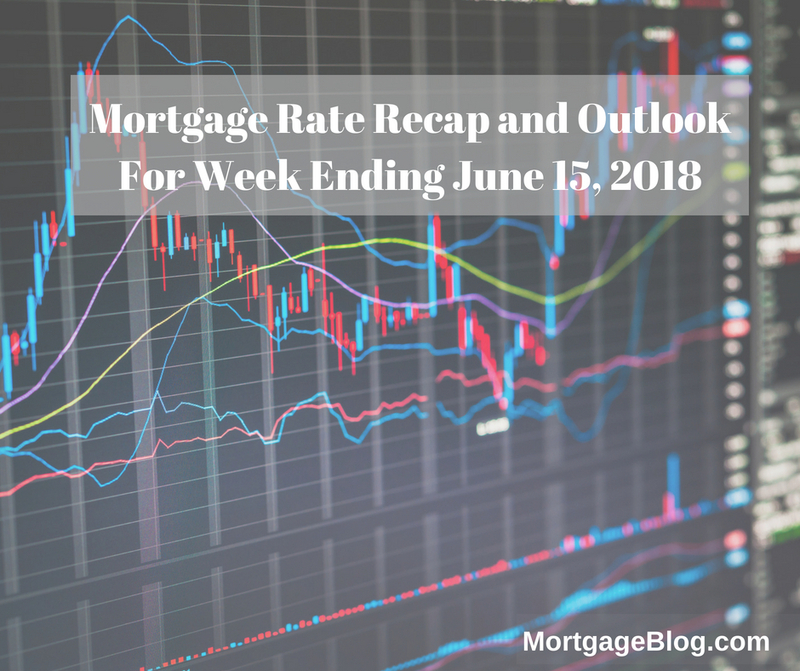 After trending down for the last two weeks, mortgage rates increased over the previous week and could continue that trend. This week saw the Federal Reserve raising not only the Fed Funds rate, but also the Prime Credit rate, and the Reserve Balance rate. In comments by the Federal Reserve Chairman, Jerome Powell, a hawkish shift from the Fed is apparent. Based on robust economic data, healthy rate of job growth and increased consumer spending, the Fed feels the potential to increase rates again in 2018 is likely. The increase in Retail Sales is especially notable with numbers coming in at 0.8%, 100% above expectations of 0.4%. This is the highest surge in eight months. It’s also noteworthy that the number of individuals unemployed and looking for work is currently less than the actual number of jobs available. The fear of trade wars with the coming tariffs has created an increase in Import prices, like steel and aluminum, which reflects the amount of hoarding going on in anticipation of trade wars. Despite robust economic health, many businesses are holding back on investing in growth and development due to the fear of potential trade wars. This fear is one of the factors keeping rates from increasing to the level that should be rising to given the recent high economic data, rising interest rates, and a hawkish Fed. The other factor is that the US is still buying mortgage-backed securities, which is helping to keep pricing artificially low. Overall, there is nothing to suggest that the market will be swinging back to bring us lower interest rates in the foreseeable future – if ever. This candlestick chart below covers the past weeks’ Mortgage Backed Securities (MBS) activity and the impact on interest rates. 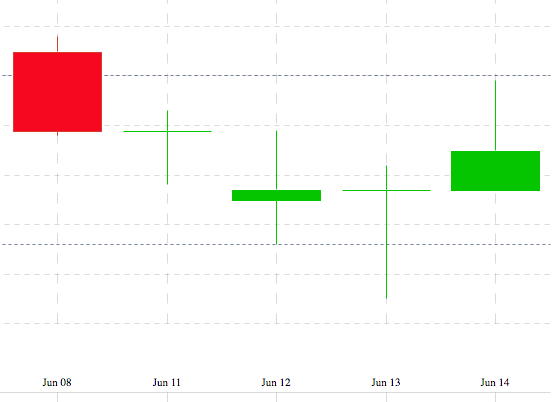 Rates worsened, as seen in the candlestick chart. MBS directly impact mortgage rates, and the days with red indicate higher and green lower rates. This week’s Mortgage Banking Associations’ (MBA) weekly rate survey shows effective rates increased for all loan products with an 80% loan-to-value. Bankrate’s weekly survey of mortgage and economic experts, countrywide, shows a split of 27% predicting interest rates will fall this coming week (plus or minus two basis points), and 27% predicting they will remain unchanged. The majority (45%), however, expect interest rates to increase next week. 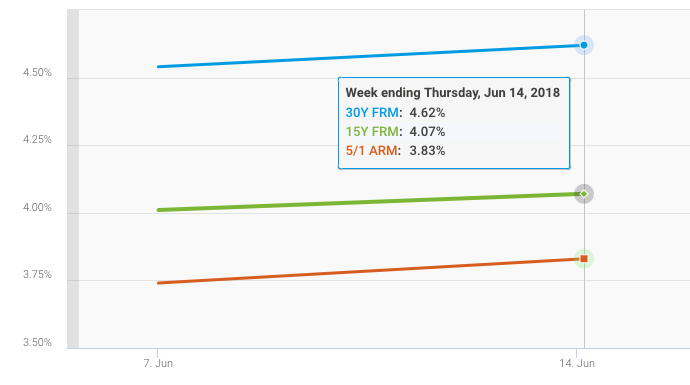 The chart below, from Freddie Mac’s weekly mortgage survey, shows conforming rates increasing over the last week, June 8th to June 14th, for 30Y fixed, 15Y fixed and the 5/1 ARM. In Freddie Mac’s weekly mortgage survey it was noted that “After declining for two straight weeks, mortgage rates reversed direction this week and rose to their second highest level this year. The 30-year fixed-rate mortgage climbed eight basis points to 4.62 percent, and the Federal Reserve Board on Wednesday raised the federal funds rate by 25 basis points. Highly recommend locking in a rate now if you are purchasing or refinancing. Any number of economic triggers could continue to move interest rates higher and today’s levels will look like a bargain.